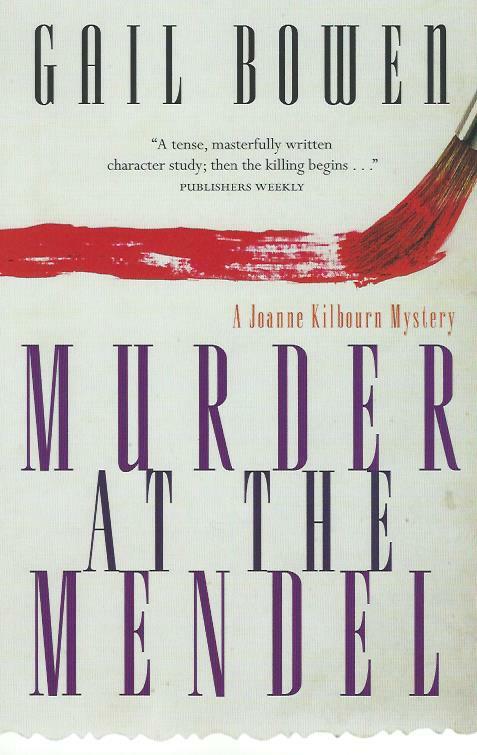 Murder at the Mendel (1991) is the second in the Joanne Kilbourn series by Gail Bowen, following Deadly Appearances (review here). At this point, Joanne has moved to Saskatoon and taken a temporary job teaching at a college while she finishes a biography that she has been writing. Two of her children are in college in Saskatoon: Mieka, her daughter, and Peter, her eldest son. Peter and her youngest son, Angus, live with her. An old friend from childhood has shown up again in Joanne's life, and Joanne is not quite sure how to take her reappearance. The friend, Sally, is estranged from her mother and her husband and child, and has shocked some citizens of Saskatoon with her latest works of art, a group of paintings titled "Erotobiography." She was also involved in a very tragic event in Joanne's life when both women were in their teens. This book is a story of relationships, family, and trust. It is very different from the first book in the series but does explore similar themes. As in the first book in the series, the story is told in first person and Joanne is not really doing any sleuthing. But there are murders and the reader (at least this one) is interested in figuring out who the culprit is and what the motives might be. Joanne is not the best judge of anyone's actions or motives in this case, because of her deep involvement with Sally and her family. I enjoyed the book very much. The story of Joanne and her family and friends and how they cope with the deaths was as interesting as the investigation of the crime, which is almost in the background. I enjoyed it so much that I went out and bought the next two books in the series before I had finished this one. I want to see how the series develops. And, the fourth book, A Colder Kind of Death, won the Arthur Ellis award for best novel. I am not overly fond of amateur detectives in mystery novels, so I was just as glad that Joanne was not actively involved in trying to aid in discovering the murder. I am enjoying reading about real locales in Canada, and Gail Bowen does a great job of describing Saskatoon and its people. It was also fun to read a reference to a landmark in California. Sally is describing a trip with an older man who was her mentor. The motel referenced is The Madonna Inn. "... Once he did a class in San Luis Obispo for a month or so." She smiled at the memory. "Oh, Jo, we stayed at this motel that had fantasy rooms -- a real fifties place -- the court of Louis, jungle land, the wild west, that kind of thing." I read this mystery for the Canadian Book Challenge 6. This is my twelfth Canadian book that I have read for that challenge. Tracy - I'm a fan of this series too. I'm so glad you pointed out the really well-developed characters, setting and relationships in the novel. I think that's one of Bowen's real strengths. I also like Joanne Kilbourn's character simply because she doesn't pretend to be more than she is. She is a very authentic kind of person. I'll be looking forward to what you think of the next books in the series. Margot, I am looking forward to reading the next one in the series. Not sure if it will be this year but I hope so. Thanks for reminding me to get back to this series, Tracy! I read the first book last summer, I think, and I really liked it. Rebecca, I like the series a lot so far. It is a very different type of mystery for me. TracyK: What a coincidence. 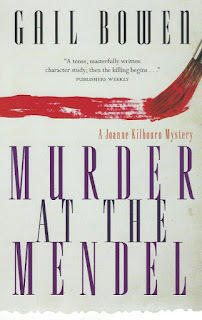 I just re-read Murder at the Mendel and will be posting my review in 1-2 weeks. I enjoyed reading it as much the second time as the first time. You have lots of good reading in the series ahead of you. Should you ever get the opportunity to go to an event attended by Gail I encourage you to be there. Gail is a wonderful person. Bill, that is a coincidence. I am looking forward to your review. I have gotten the impression from interviews of Gail Bowen (online) that she is a nice person. Moira, Glad to hear that you like the Gail Bowen books. Sounds like the series will continue to be an interesting read. I don't know why I had never heard of her before the last year or so (when I started reading Margot's blog and Bill Selnes' blog). Tracy, thanks for a succinct review of this book. I like the way you review your books. I have read about Gail Bowen and her work online, including (I think) a review of one of her books and an interview with her by Bill Selnes at his blog. She is a well-respected figure in literary circles and I hope to read her books which seem to afford light reading. Prashant, Thanks for the kind words. I hope you do get a chance to read some of her books. Sounds great TracyK and if the characters are compelling then I can forgive almost anything frankly but if the plot is also solid that is a real bonus - will definitely look this series up. Sergio, this an author worth trying. I am interested to see how the series continues, since she isn't really a detective or in a related field. But like you say, if the characters are good, it makes up for a lot. I haven't read any of this series but I know Bowen comes highly recommended. My TBR is just too long at this moment but I'll bear her in mind. Sarah: As I was just reading at another blog...There are too many books to choose from nowadays. An embarrassment of riches. Should she ever be on your TBR pile, I think you would enjoy trying her out. TracyK: Just got my review posted for the Alphabet in Crime Fiction meme. I am glad you enjoyed the book. I think you will yourself engrossed in Joanne's life and the mysteries. I long for a T.V. series that directly portrays the books. The T.V. movies made from the early books were moved to a vaguely Ontario city. I refuse to watch them.